* While the employment report was generally poor (including a horror show household figure that was the worst since December 2009, excluding the government shutdown), there was still a nugget of light or two. 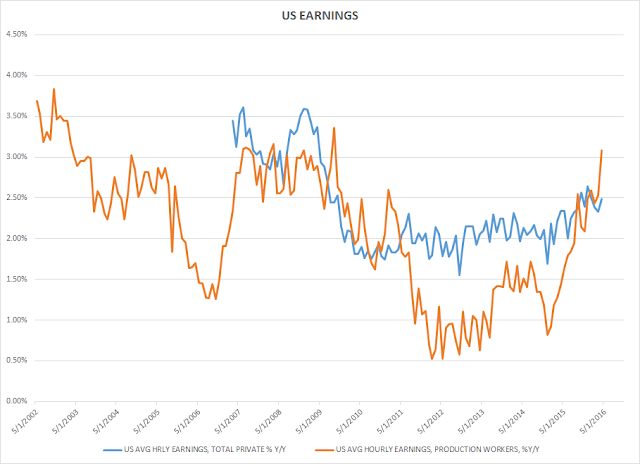 Macro Man was particularly interested to see another uptick in manufacturing wage growth, which has now pushed above 3% y/y. Readers are invited to speculate for themselves what this might imply for corporate profits and/or inflation. * The news was not particularly rosy in China, either. Although the trade surplus was some $5 bio higher than expected in April, it was driven largely by much weaker than expected imports, which dropped nearly 11% y/y. 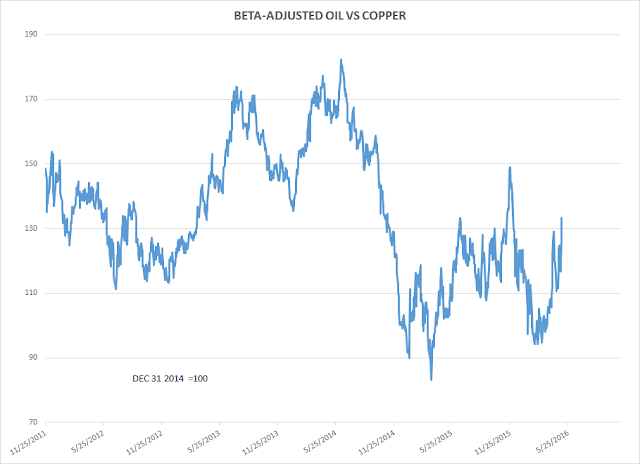 Given that steel rebar and iron ore prices have shown signs of topping recently, the recent weakness in the commodity complex could well just be a case of 'reality bites". Maersk is not in the business of bulk shipping so the Baltic Dry index is the wrong Price here. 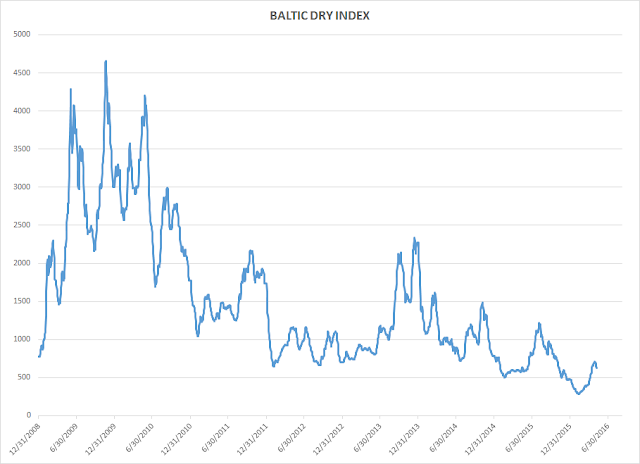 The picture does not become prettier if you look at the Shanghai containerized freight index (also in Bloomberg) - it actually lacks the recent rally in bulk prices. The most useful question I think we can all ask ourselves is "wheres the next pain trade?" Short $ looks like the trade to be late to this month and the opposite to that is long commodities. Recently I have felt like a 20 something accountant at a party full of singles. "So, what is it you do ?" ahh, ummm. I may be a bit late to the China bear club, having decided to attend other parties before the China one warms up, but the weekend data re imports and more importantly the articles in the China Daily about lleverage being te greatest sin, has me thinking the main act is about to arrive on the main act is about to come on stage. Iron down 7%, copper down huge again ( yes yes I 'm stopped out again in the S+M club of long copper) is hardly compensated by an historic (March) German manufacturing number. So, throw those into a market that saw a US FEd influence global bounce on Friday and I think we could fall over again. But of course , as others here have been saying, THis is not the easiest market to decide on medium term positions. China is the San Andreas fault trade. You know it's overdue a shake down, but people still move there. Daily sniping appears to be more profitable than 6+ month views which just end up being bimodal as to comment board input. Well, I would like to thank those of you who post with a name. Whether I agree with what you post, the only way to be more informed is to read something that someone else has experienced or thinks. The nattering nabobs of anonism don't blow my skirt up very high at any time. @MM Curse you for appropriating a full hour of my life through the 'music from the ages' link. @Pol -"China is the San Andreas fault trade. You know it's overdue a shake down, but people still move there." Quite a gem - wish I had come up with that. 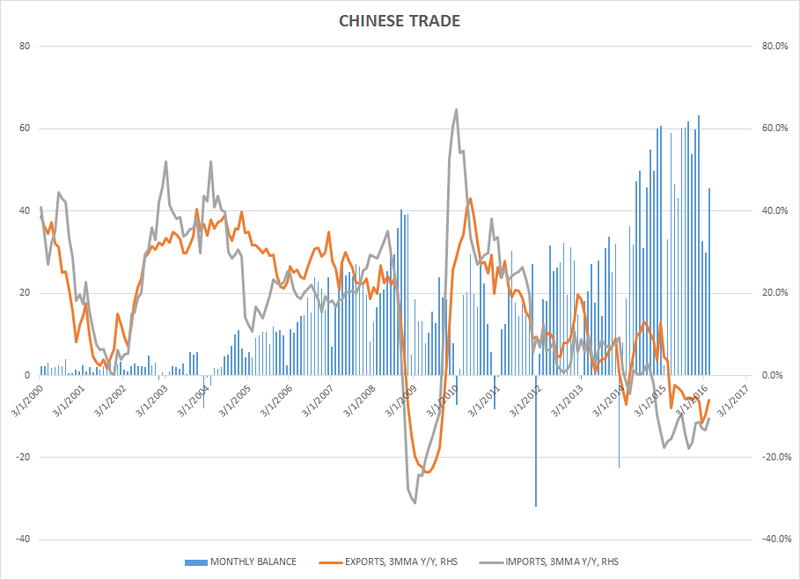 I definitely feel China is slowly making its way back to the worry list, but not yet in a sky is falling kind of way - Don't know if this is the time to short, but I would definitely be nervous if I am long or bullish that general theme. As for the oil rally because of the fire, for the millionth time guys, focus on the backs - MM you may find the same plot a bit different if you did it vs Cal 20 or Cal 22 for the two. Taiwan's exports to post a year-on-year decline in April for the 15 consecutive month. Taiwan exports actually did better than the month before, which is not the case for SKorea or Singapore. GDX holding up pretty well given the price action in gold. oh and on REITs, remember they are to become a GICS independent sector, with inflows ranging from 5-100B (so really no consensus) of inflows at the end of August. i generally get the feeling that bears want to be short but are hesitant ...most people defensive in their mind but not positioned for a leg down..
Of note today, USDJPY a lot higher, Spoos not tracking. That rather exotic correlation is history, apparently. "Oil up on fire in Canada" drove me nuts last week, but a return of cooler weather to the Great White North is hosing down the oil specs today. We are short USO. The Monday morning commodity slaughter also took down gold and GDX. We remain long DX and short CADUSD. A bump in Spoos into OpEx at the end of next week? Seems likely. We are neither long nor short, but we are running a small short at the long end of the curve through the Tsy auctions and into Friday's retail sales number. Not much data this week, retail sales on Friday the most important.